We are so pleased to have this magnificent large shallow bowl/platter to show you. Made in 1999, it is 13 ½’ across. Stunning and traditional! 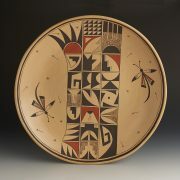 The Tafoya family is a remarkable family of masterful potters. Sara Fina Tafoya passed down her skills to her daughter, Margaret Tafoya, and many of her siblings. Margaret, in turn, passed on that same artistic gene to her children and grandchildren and for further generations to come. 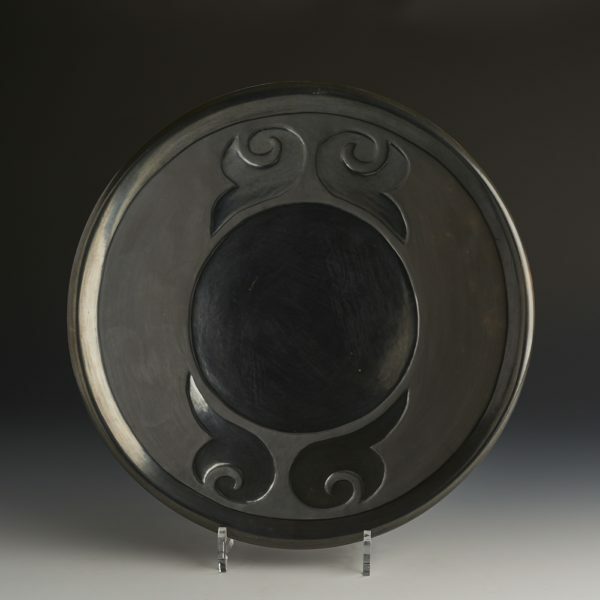 Lu Ann Tafoya, born in 1938, is Margaret’s daughter, and produces magnificently coiled jars, bowls, and plates with marvelous burnished surfaces. She is known for her ability to create very large works of art. 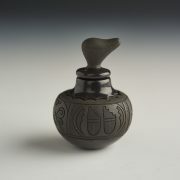 They are often large, highly polished black and red vessels decorated with variations on classic imagery and forms, like traditional bear paw imprints, the avanyu, clouds, birds, kiva steps, winds and gourds. The pots are still fired in traditional open firing.